The following definitions (in normal type) for the Torddu and Torwen sheep are taken from the Flock Book. The additional notes (in italics) are intended to provide clarification of how the definitions are interpreted for judging and registration. Face - Well marked with typical badger stripes which will generally be at least 3/4" wide. Very fine "pencilled" stripes are undesirable. Apart from the black markings the face can be off-white, grey or tan coloured. Individual preferences as to face colour will not affect registration. Ears - Small, dark inside. Large broad ears are not desirable and not true to type. Throat - The black band connecting the underside of the jaw with the black belly is now considered essential for registered Torddu sheep. The most recognisable characteristic of a Torddu is the stripe that runs from the under side of the jaw to join the black belly. There must be no break in the stripe and grey is undesirable in the black. A minimum width is not stated, however a definitive edge is preferred. Underside - The black belly colouring should be most noticeable and be carried well up under the tail. Black belly wool is essential. The black belly wool is essential and should continue well up under the tail . The area either side of the tail (trousers / britches) should be black with no visible white or grey. This usually gets worse with age. Legs - Should be predominantly black with a light tan stripe. Should be predominantly black and must have a stripe ( this can be off-white, grey or tan —usually the same colour as the face). Preference will be given to complete stripes. Broken or very thin stripes are undesirable but may be considered when all other points are satisfactory. Upper wool - This can vary from pure white through grey to very light brown or tan shade. Preference should be given to the lighter colours. 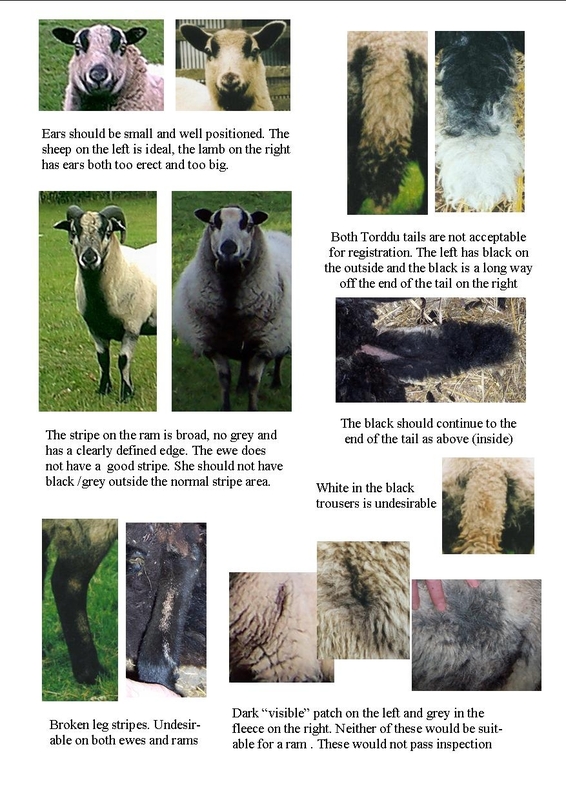 Visible black or dark grey wool in white areas is not acceptable. This topic is one which causes much discussion. Many prefer to see some kemp, especially as it is a sign of hardiness and others prefer dark fleeces. Inspectors will look for “patches” rather than variation between sheep. Darker wool which would be sheared off is preferred to dark wool grown from black skin. Fleece - should be soft, firm and close as for Welsh Mountain sheep. Red kemp is an undesirable feature. A loose fleece is also undesirable. Red kemp is undesirable, but may be overlooked. Horns - If present on rams should be spiral in growth and dark coloured. Horns or horn buds on ewes are not acceptable and not true to type. On rams only, horns are preferred but not essential. When buying a ram, check for shortened or removed horns as this ram may produce offspring with badly shaped horns. Tail - Must be full length, the underside to be black to the end of the tail. The tail should be full length. Obvious signs that the tail has been shortened will result in the ram being rejected. The underside of the tail must be black to the tip. There should be no black wool visible on the outside, however some may have twisted tails. Consideration may be given if the black falls a short distance from the tip ( if all other points are acceptable). Head - Black (dark brown) with distinct white stripes running along eyes towards nose. White area under jaw running as far as possible down throat towards chest. Should be black or dark brown with distinct white stripes running along eyes towards nose. Over time this has become smaller and is often referred to as a “tear drop”. The lower jaw should be white and this area should run as far as possible down the throat. There should be a minimum of a bib. Ears - Small. Outside of the same colour as head and wool over body. Inside, of same colour as under jaw, head stripes and under body. The outside should be the same dark colour as the head. Inside should be a light colour as the white area under the jaw. There should be no lighter colour on the outside of the ear. Large broad ears are not desirable and not true to type. Body wool - Main colour black (dark brown), preference to darker colour, with as little grey in fleece as possible. The belly white and this colour showing distinctly around tail. Main colour to be black or dark brown, preference will be given to darker colours. (It is accepted that different soil types/minerals can make a difference to wool colour). There should be no grey in the fleece. Experience has shown that sheep with more white down the throat and neck tend to have more grey in the fleece and appear to turn grey much earlier than the darker sheep. 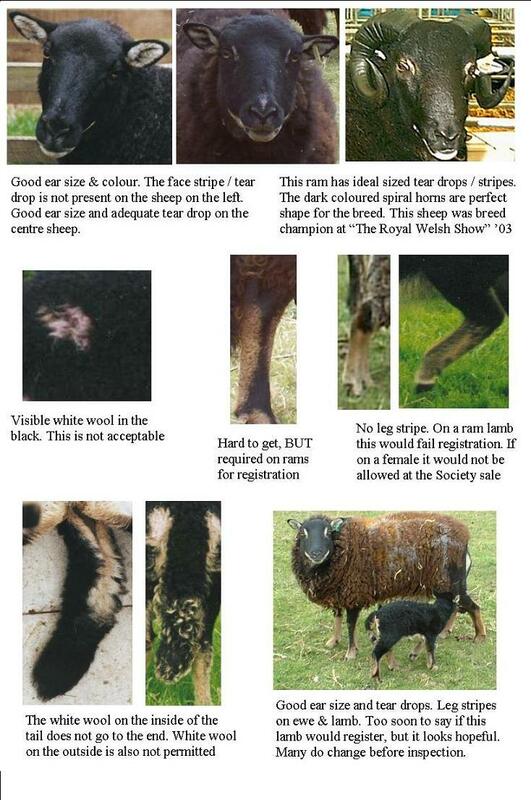 Visible white or grey patches in the wool are not acceptable. The belly wool must be white and this colour should show distinctly around the tail. Tail - It is important that the tail and surrounding marking be distinct. Outside of the tail as dark as possible from top to tip. Under side of tail white. Tail must be full length. Outside the tail should be as dark as possible. The underside must be white to the tip. Consideration may be given if the white wool does not extend right to the end. (if all other points are acceptable). Obvious signs that the tail has been shortened will result in rejection at inspection. Removing faults from tails does not stop this genetic characteristic passing on to the lambs from these rams. Legs - Predominantly tan with a black stripe. The stripe should be full length, however it is recognised that this is often very difficult to get. Pre 1995 in the “points of breed” leg stripes were “preferred”. Since then stripes became essential in the breed description. Broken stripes are un-desirable, however consideration may be given if all other points are to standard. Many ewes without leg stripes are kept for breeding . It is worth noting that these ewes would not be allowed in the Society sale. Horns: If present on Rams, spiral and black. Horns or horn buds on ewes are not acceptable and not true to type. Horns are no longer essential for registration. Wool: Fleece should be soft, firm and close as for Welsh Mountain sheep.